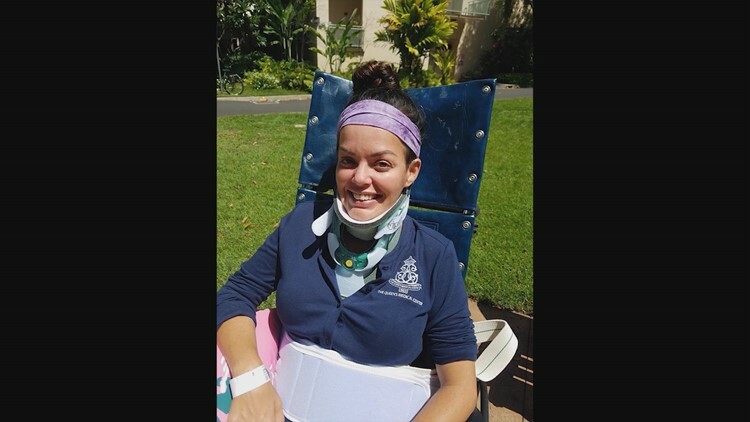 A large wave overcame Nikki Lewis and slammed her headfirst into the sand, breaking her neck and partially paralyzing her. HONOLULU – From her hospital bed in Honolulu, Nikki Lewis might not know the impact she is having. Her husband and mother are by her side, documenting her recovery, and every video they post to Facebook, especially the one from Sunday of Nikki singing “You are my Sunshine,” is powerful. When they watch Nikki feeding herself and sitting up or standing up, they feel like they’re watching a miracle unfold. Pillot and Ja’Mikal Moorer are some of Nikki and Will Lewis’s best friends, so it only made sense for them to join the Prosper couple in Hawaii. On September 12, most of the family had gone home. But the flight back to Dallas for Pillot, Moorer and one other friend was delayed for a day, so the group went to Big Beach on Maui. “I just saw the wave towering over her as she was on the boogie board,” Moorer recalled, describing the last moment he saw the bride. The wave overcame Nikki and slammed her into the sand headfirst. She broke her neck, was immediately paralyzed, and was unconscious. “It took four grown men to get her out of the water - between the waves, the sand, the incline,” said Moorer. They don’t know who that man was, but they are hoping someone who reads or sees their story can help find him. Nikki is making tremendous strides, and her friends and family set up a GoFundMe page to raise money to try to bring the newlyweds home to Dallas. Her friends are so inspired by her will to recover, they say her strength is making them stronger.